Chicago come away with a solid draw and keep Toronto near the bottom of the Eastern conference table. Toronto FC: Bono; Auro, van der Wiel; Bradley, Morgan; Delgado; Hasler (Ricketts, min. 75), Aketxe (Fraser, min. 81), Vázquez (Hernandez, min. 75), Osorio; Giovinco. Chicago Fire: Sánchez; Ellis, Kappelhof, Schweinsteiger, Lillard, Vincent (Gordon, min. 82); Katai, McCarty (Bakero, min. 76), Adams; Nikolić, Collier (Campos, min. 67). SCORE: 1-0, min. 8, Osorio. 2-0, min. 22, Vázquez. 2-1, min. 69, Schweinsteiger. 2-2, min. 94, Gordon. REFEREE: Alan Kelly (USA). Yellow Card: Katai (min. 73), Hernandez (min. 80). Two second half goals from Bastian Schweinsteiger and Alan Gordon insured that Chicago Fire came away from BMO Field with a point. Toronto FC had taken the lead in the first half but the visitors battled back to gain a big point away from home. Toronto FC started the game like they had a point to prove. After their heart-breaking loss in the CONCACAF Champions League final, this was the chance to get their Major League Soccer season off and running in the right direction. 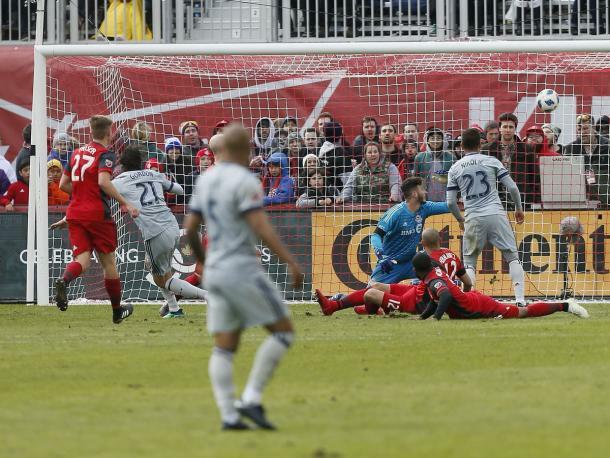 Sebastian Giovinco got onto the end of a long ball over the top and found Jonathan Osorio unmarked inside the six yard box for an easy finish in the eighth minute. Giovinco was then on the receiving end of a pass from Nicolas Hasler for what he thought was Toronto's second goal but the VAR ruled Hasler offside so the 11th minute goal was chalked off. Toronto would get the second goal their first half display had earned when in the 21st minute, Michael Bradley's miscue ended up at the feet of Víctor Vázquez who executed a cheeky chip from a tight angle to score. 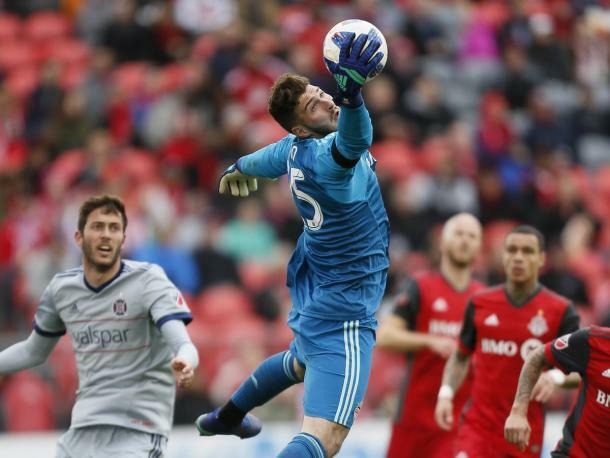 Alex Bono was then called upon to make one of many big saves for Toronto in the 36th minute of the match. Ashtone Morgan brought down Nemanja Nikolić inside his own area which was not seen by referee Alan Kelly but it was picked up by the VAR system and so Bastian Schweinsteiger stepped up to put Chicago within one of Toronto. Schweinsteiger went to his left and Bono was there to parry the ball away goal and from any incoming Chicago players looking for a rebound. The second half was a different story. Chicago seemed to have more intent in them while Toronto, for whatever reason, decided that two goals was enough and they were going to drop back and defend their lead. The home side was punished for that attitude when in the 68th minute, Schweinsteiger got onto the end of a Kevin Ellis nod on and guided the ball past Bono. Chicago then went on the offensive, which Toronto had no answer for. Jon Bakero should've put Chicago ahead in the 79th minute after some good build up play by the away side but his shot was blocked by a diving Toronto defender. Chicago continued to push Toronto back and in the last ten or so minutes of the game, you felt that it was only a matter of time before Chicago found the winner. They did through Alan Gordon in stoppage time as the long-time MLS veteran popped up to head home and gain all three points for the Fire.